The bitterness and hatred with which Owei Lakemfa wrote his piece (titled “Fani-Kayode: Tales His Father Told Him,” The Vanguard Newspaper, Nov 25th 2009) about Chief Femi Fani- Kayode and his late and highly respected father, the Balogun of Ife, Chief R.A Fani- Kayode Q.C., S.A.N, C.O.N clearly reveals the fact that he cannot be regarded as an impartial columnist who seeks to establish the truth but rather he can be seen more in the light of a subjective and venom- filled commentator who is on a hatchet job for unseen forces. Let me start by saying that it is most uncharitable for a columnist to not only be intellectually dishonest but to try to foist his cheap and biased opinions on others by taking advantage of the fact that he has a column is absolutely despicable. He not only seeks to spread falsehood here but he also seeks to continue to perpetuate and spread age-old myths about some of our elder statesmen, nationalists and founding fathers and thereby bury them in the dustbin of history. What people like him fail to appreciate is the fact that a lie, no matter how often repeated, can never be the truth. I will ignore the vicious comments that he made about Fani-Kayode the younger and the role that he played in Obasanjo's government. Needless to say I do not share his petty views or his penchant for vitriol. What I will say however is that in my view Femi Fani-Kayode was not only an effective spokesman for President Olusegun Obasanjo but he was also an excellent Minister who is presently facing all manner of persecution from the Yar'adua government due to his proximity to Obasanjo and due to the fact that he presents a very real threat to the ambitions of a former senator who was accused of the murder of Chief Bola Ige and who sees Fani-Kayode as the only threat to his governorship bid for Osun state. I do not believe for one minute that Fani- Kayode did anything wrong whilst in office and I believe that just as this government is seeking to destroy Obasanjo, Nuhu Ribadu and Nasir El Rufai, so they are trying to destroy him. I remember very clearly how terrible it was to fly in this country before he was redeployed to the Ministry of Aviation and how when he got there all the plane crashes that had taken place before then and in the previous year(5 crashes in one year) suddenly stopped. This is what the great man that Owei is now trying to denigrate and write about in such disdainful terms managed to achieve. You may not have liked Fani- Kayode's style or even the nature of his job when he was at the Presidency but two things that you cannot take from him was firstly his brilliance and sheer eloquence when it came to his submissions and arguments and secondly his positive impact at the Ministry of Culture and Tourism and then later at Aviation when he was appointed as a Minister. And now to the main issue. So filled with hatred is Owei that he even seeks to deny Fani- Kayode the right to tell the world the truth about his fathers role in moving the motion for Nigeria's independence. And Fani- Kayode is absolutely right on this and what he claimed can hardly be described as a tale as Owei is trying to suggest. The problem is that half education is the worst thing that can ever afflict anyone. As a matter of fact it is better not to be educated at all than to be half educated and to think that you know it all . Owei should go and check Hansard of the late 50's where all the proceedings that took place in Parliament in those days were recorded and read about what actually happened instead of relying on folktales and half truths. Luckily the British have kept such records even if we in Nigeria have refused to do so either because we are incapable or because we are not interested in the truth but rather in falsehood and fabrication. Hansard confirms the fact that Enahoro attempted to move the motion in 1953 and it failed. It confirms the fact that Chief S.L. Akintola successfully moved the motion in 1957 in Parliament and argued that we should be granted independence in 1959. The problem with Akintola's motion however was that it was not accepted by the British and consequently it failed as well and we did not get independence in 1959 as Akintola had wanted. It was�not until 1958 when Chief Remi Fani- Kayode moved the motion for Nigeria's independence in the Federal House, which he proposed should take place on April 2nd 1960 ,that it was not only successfully moved and accepted by Parliament but that it was also acquiesced to and accepted by the British authorities. There was a slight modification to the proposed month in 1959 when Sir Tafaewa Balewa moved a motion in Parliament that it should no longer be April 2nd 1960 but instead Oct. 1st.. That motion was seconded by Chief Raymond Njoku and it was accepted by Parliament and the British. These are the facts that Fani-Kayode reiterated in his interview with Pointblanknews.com and they are incontrovertible. He also challenged his readers to go and read Richard L. Sklar's book (the respected American historian who was an authority on the politics of the 50's and 60's in Nigeria) titled “Nigerian Political Parties: Power in an Emergent African Nation” (pg.269). In his hatchet job Owei conveniently forgot to mention that reference and source. As a matter of fact he completely ignored it. Now if Hansard is not to be believed by Owei and if Richard L.Sklar is not good enough for him either, then perhaps Owei should go and read the respected Professor Sanya Onabamiro's book titled “Perspectives on Nigeria's History” (pg 140 )where again these facts and sequence of events were corroborated and confirmed. Professor Onabamiro was a big player in the politics of the 50's and 60's too and he should know. It is a pity that people like Owei and I daresay countless others would go out of their way to distort the truth and attempt to pass off pure falsehood as truth all in an attempt to give the impression that no Fani-Kayode ever did anything good for Nigeria. The most important point is that Femi Fani- Kayode, if nothing else, with his celebrated independence day interview with Pointblanknews.com(which was fully reproduced in the October2009 editions of both the Nation and Leadership Newspapers) has successfully debunked the erroneous notion that Chief Anthony Enahoro successfully moved the motion for Nigeria's independence, which sadly, is what most Nigerians believe. Yet despite this Fani- Kayode was still very charitable to Enahoro by acknowledging the fact that he played a key role by beginning the process in 1953. Of course this was not enough for the likes of Owei: he just had to attempt to take him to the cleaners for setting the record straight and telling the truth. If he had stopped there I would have given him the benefit of the doubt and attributed his rantings and inglorious submissions to nothing but a vulgar display of ignorance by a misguided writer. But no, it did not stop there but rather it got worse: this was a vicous hatchet job. And Owei went even further than that. He actually attempted to pass off a quote by the late Oba Akran, a bitter enemy of Chief Remi Fani- Kayode from a rival political party, as not only being an accurate and objective assessment of the man but also as a quote by the late Ladi Akintola, the son of the late Chief S.L Akintola. Needless to say these were not Ladi Akintola's own views about Chief Fani- Kayode: he simply quoted Oba Akran and if Owei expects that a man's political enemies will say the best about him then he knows nothing about Nigerian politics. Owei adopted the same venal method when he quoted the respected Professor Wole Soyinka's opinion of the late Fani-Kayode and again the opinion of a less respected and notorious murderer and coup plotter by the name of Major Adewale Ademoyega, which the latter documented in his book. But again Soyinka was a political opponent of Fani- Kayode and Ademoyega was a man that had tried to kill him and who actually killed a number of other prominent people and their families in his attempt to take over Nigeria on January 15th 1966. Does Owei really expect anyone to take the account of a man like that (Ademoyega) seriously? And when armed men storm another man's house looking for his life is it an act of bravery for the man to stay under his bed and attempt to hide under the sheets as Fani-Kayode refused to do or is it not true courage for him to immediately get up and go outside and meet those that had come to take his life as Fani- Kayode did, apparently without any hesitation whatsoever. And yet Owei calls him a coward for doing so and his only evidence of this apparent cowardice are the words of one or more of the mutineers all of whom have innocent blood on their hands? Again does Owei know what military personnel and security people call disinformation? Is it not obvious to him that the mutineers sought to justify their actions by painting their victims and prey and those they sought to kill as less than decent, honourable and courageous people? Is Owei so gullible or does it just suit his purpose to believe such drivel? In any case such was Chief Fani-Kayode's impeccable english and sheer eloquence that there is no way that he would have condescended to speaking pigeon english to anyone and certainly not to a bunch of bloodthirsty and wicked mutineers who had butchered and killed so many families that night. The worst aspect of Ademoyega's sordid tale is that he wasn't even there to witness any of these events himself as he was not in Ibadan but in Lagos on that night where he was busying murdering General Maimalari his own commanding officer. Yet Femi Fani- Kayode was there himself and personally witnessed these events. Owei should not take the words and opinions of political opponents about one another too seriously and he should not try to pass them off as truth or historical fact. This is completely irresponsible and is the highest form of intellectual dishonesty. It is also against the ethics of journalism where they say that facts are sacred and opinion is cheap. I could also list the most wonderful things that people wrote about Chief Fani- Kayode in the 50's and 60's and publish them here but at best I would have to say that these were just the opinions of those that believed in him and that were on his side during that brutal and unfortunate conflict in the Western Region in the early sixties. I would certainly not attempt to pass off these opinions as political and historical fact. Owei should learn from that. Again I could quote and give an account of many of the most uncharitable and unprintable things that the enemies of both Professor Soyinka and Major Ademoyega have said about them in the past right here but that does not make such submissions necessarily true. These are just the opinions of their opponents and the minute anyone starts regarding such opinions as being completely true and sacrosanct then they really are in danger of being misled and of sounding absurd. If Owei believes that Chief Remi Fani- Kayode was a murderer, arsonist, fascist, coward and everything else under the sun he is entitled to his opinion but he surely does not expect that everyone will share his view. Worst still he cannot expect Chief Fani- Kayode's most prominent and distinguished son not to set the record straight and tell the whole world about what he sees as his father's positive and distinguished role in Nigeria's history. Owei cannot deny him that right, he cannot intimidate him or anyone else into silence and neither can he pass off lies, slander and falsehood of the most vindictive and vicious type as historical fact. It is no wonder that this country has not progressed when those that fought so hard and sacrificed so much for our nation's independence are still being denigrated as a consequence of hatred and envy and an ancient political feud within the Action Group. 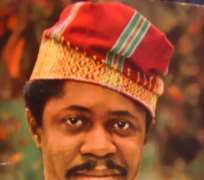 In my view Chief Remi Fani-Kayode was one of the greatest and most distinguished men that Nigeria has ever produced. A man that excelled in the legal profession and a man that represented the Action Group in Parliament throughout the 1950's and who later went on to play a key role in the NCNC and NNDP. During the early fifties and before going into Parliament this man was the National Youth Leader of the Action Group and by the early sixties after he decamped to the NCNC he was immediately elected as the Leader of the opposition in the Western House of Assembly. He later formed the NNDP Party with Chief S.L Akintola and from there he was elected Deputy Premier of the Western Region. Again during the fight for independence Chief Fani-Kayode was locked up a number of times by the British Colonial authorities and again later by the military regime of General Ironsi. We should revere such selfless men that have paid such a heavy price and given so much to this nation even if we were not on the same side as them politically and Owei should show a little more respect and decorum. It is a pity that I do not know who or what his father was or is otherwise I could have done a nice piece on him too. Sadly though I have never heard of the man. Historical revisionists and bitter men like Owei should give peace a chance and allow the bitter wounds and political divisions of the past to heal. And if his diatribe is an attempt to stop Femi Fani- Kayode from running for the governorship of Osun in 2011 or to deter him from continuing to set the record straight about the noble role that his father played in the politics and legal profession of Nigeria from the 50's up until 1995 when he passed on, then Owei has made a grave miscalculation and clearly does not know the man. His father was a lawyer, a great politician, a former Minister for Local Government Affairs in the government of the old western region and the powerful Deputy Premier of the Western region. The son is also a lawyer, a great politician, a former Presidential Spokesman and a former Minister of Culture and Tourism and later Aviation of the Federal Republic of Nigeria. He is now aspiring to be governor of his state. That is no mean achievement and it would take more than a million Owei Lakemfa's and their poisonous pens to destroy that type of rugged and courageous stock. People are just too enlightened and educated to buy into that type of negativity and propaganda nowadays. My suggestion to Owei? Please stop wasting your time trying to destroy political dynasties and other peoples families: instead use your pen to build up people and to tell the truth. That is a far more gratifying ,productive and rewarding vocation and that is what we expect from the likes of you. FCT, Abuja, Nigeria (West Africa).